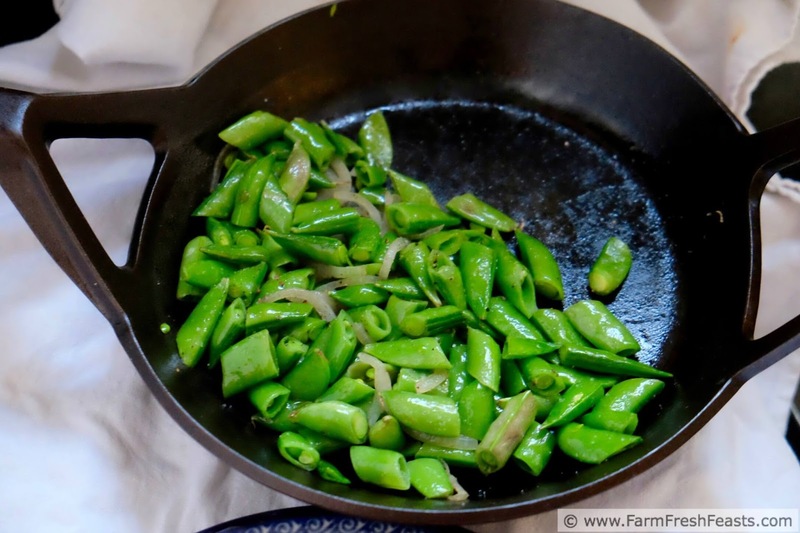 A fast and flavorful side, these sugar snap peas are quickly sautéed with spring onions for a crunchy accompaniment to any meal. 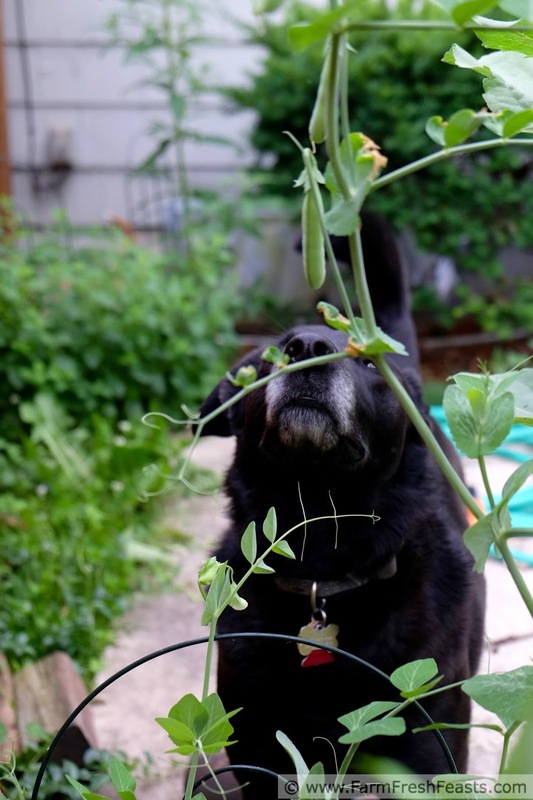 I plant peas each Spring, hoping to get a jump start on the edible goodies coming out of my back yard. I never seem to remember succession planting, though, so I mostly get just a handful of peas harvested at a time. An amount that generally gets snacked on as I walk back into the house. It's rare for me to get a working amount of sugar snap peas. Peas are so yummy raw, or dunked in hummus or our favorite Spiced Cottage Cheese Chip Dip that I tend to just eat them that way. In an effort to broaden the family's culinary horizons I've also made a Cold and Creamy Pea, Avocado and Mint Soup--but it turns out that chilled soups are not something the other household residents embrace. All the more for me. Simon's interest put all my other meh photos of peas and pea blossoms to shame this morning. My friend's Community Supported Agriculture (CSA) farm share recently gave her loads of snap peas, and she shared with me, so for a change I had both raw-for-snacking amounts from my garden as well as the opportunity to whip up a new snap pea side dish. 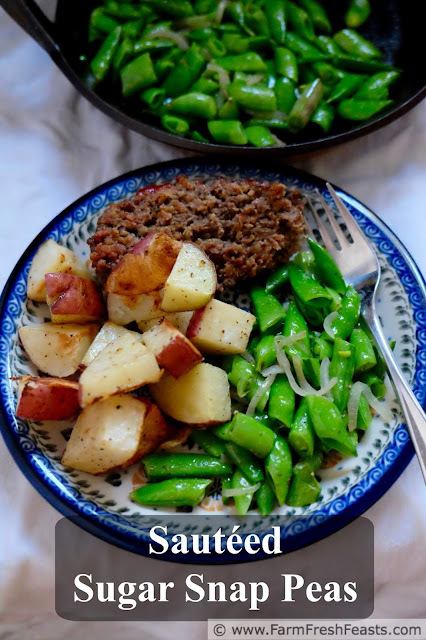 This is one of those 'that's so easy why is she even bothering to share it' type posts, but if you've got a lot of peas and are bored with snacking on them raw, please consider this alternative. For more recipes using peas, please see my Pea Recipes Collection. 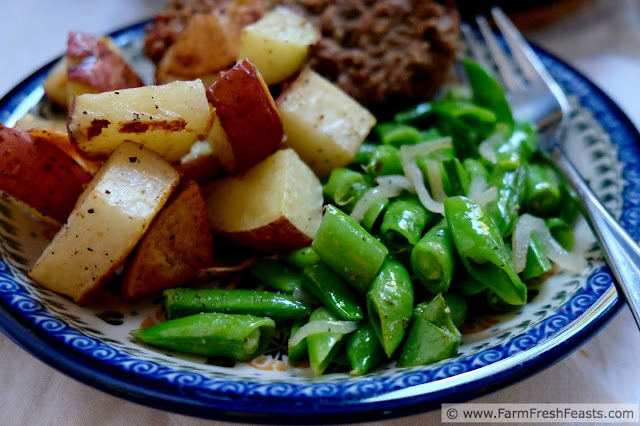 It's part of the Visual Recipe Index by Ingredient, a resource for folks like me eating from the farm share, the farmer's market, the garden, the neighbor's garden, and great deals on ugly produce at the grocery store. 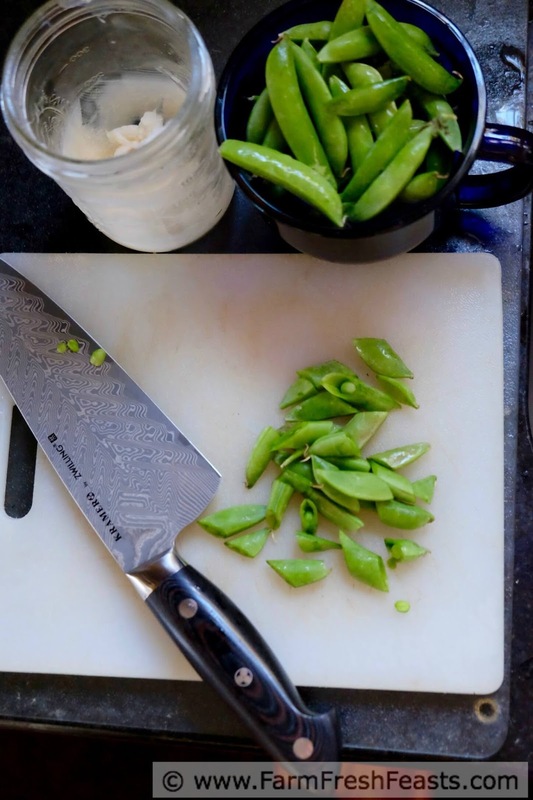 Slice peas on the diagonal into ½ inch or so pieces. In a medium to large size skillet, over medium heat, melt bacon fat. Add onion, stir to coat with fat, and sauté for 3 to 5 minutes. Turn the heat up to medium high. Add peas, stir to coat with fat, and sauté another 5 minutes until just barely tender. Season with a sprinkle of salt and a few grinds of pepper. Serve. Yum! 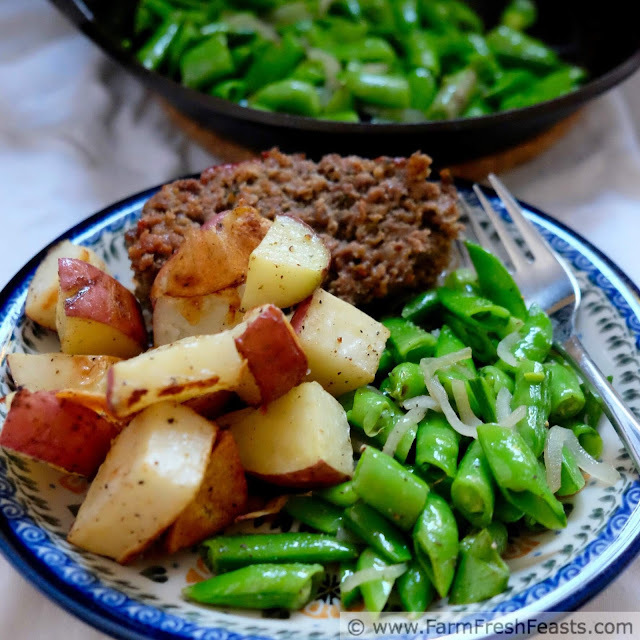 Peas almost never get cooked in our house either, for the same reasons! I will keep this in mind in case that ever changes. I love snap peas, especially raw or dipped in some hummus. This is another great idea though too.